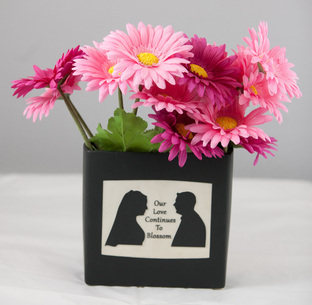 Have the song lyrics of your choice etched behind a heart that says “I love You” with your companion’s name. This vase measures 12 inches tall made of clear glass and is tapered with a 6 inch long, 6 inch wide opening. This beautiful saying reminding her of how all of life’s obstacles has only made your relationship stronger, etched on this 5 inch tall clear glass pyramid vase with 3.5 inch long, 3.5 inch wide opening. 12 inch tall, 4 inch wide glass cylinder with celtic ribbons wrapping around above and below an Irish Blessing. Here I added the couple’s wedding date at the top and the wedding dates of their children at the bottom, but you can make it your own. Shown here with a floating votive candle but can also be used as a vase.